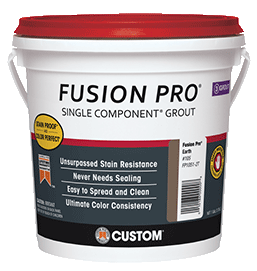 Fusion Pro® - the stain proof grout. * This professional grade grout features unsurpassed stain resistance with no sealing required. Its Single Component® formula is ready to use, color consistent and easy to spread and clean. Fusion Pro can be installed in commercial and residential environments, interiors and exteriors, and on walls and floors. Its patented formulation can be applied on all tiles and has built-in Microban antimicrobial product protection. *See warranty for details.